Skymates Flight Academy is located in Grand Prairie approximately 5 miles northeast of the Arlington Municipal Airport. The Airport is only seven miles from Arlington’s major entertainment venues – AT&T Stadium, which hosts Cowboys football, and Globe Life Park, home to Texas Rangers Baseball. Six Flags Over Texas and Hurricane Harbor water park are also just a short drive. Located immediately south of Interstate 20, the Airport offers corporate travelers convenient access to both Fort Worth and Dallas. A major regional retail shopping corridor begins directly north of the Airport along Interstate 20 and includes the Parks Mall and Arlington Highlands, providing shoppers over 300 stores and restaurants. Paragon Outlet Mall offers additional shopping within two miles. 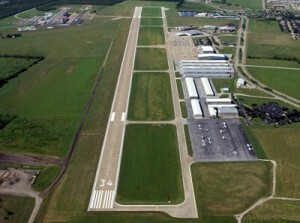 Runway 16/34 is 6,080 ft. x 100 ft. with medium intensity lighting and a full parallel taxiway. The air traffic control tower is operational from 7:00 a.m. to 9:00 p.m. each day, with extended hours when major special events are held at the stadiums. An Instrument Landing System (ILS) provides a precision approach and two published non-precision approaches are available to assist aircraft operations in inclement weather. Recent construction projects completed include the addition of 1,000 ft. to the Medium Intensity Approach Landing System, (converting the MALSF to MALSR), and installation of a 4,900 ft. x 75 ft. west parallel taxiway.